The BASTUO hammock strap is made of 100% No Stretch Polyester, 15+1 loops, can be compatible with different hammock, to ensure your safety. Althoug it weight light, but they can support up to 1200lbs, you need to spend less than 1 minute to set up the hammock with the hammock strap, then you can enjoy the Leisure time with your family or frends. 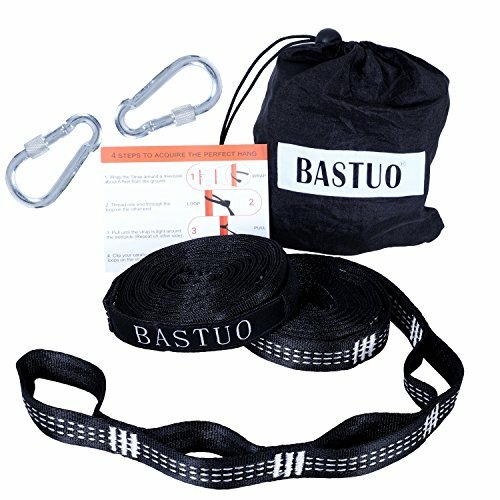 STURDY AND DURABLE STRUCTURE: Non-stretching polyester straps with 3X safey stitching , 15+1 adjustable loops, easy to make your hammock to attain the comfort height. Each strap is 10 feet long, suitable for use in almost all outdoors environments, each strap support up to 600lbs, enjoy your leisure time. BE FRIENDLY TO THE TREES: The strap is 1inch width, it is parallel winding on the tree. So it will not damage the tree. You can use it safely, best for camping & hiking.